We provide complete pool service solutions for Private, Residential, Commercial Pools, Body Corporate, Strata Managers and Pool Builders. Servicing from Ballina to the Gold Coast. Specialists in Pool Cleaning, Maintenance, Renovations, Supplies, Installations & Repairs. We provide Pool Services throughout the Gold Coast – Burleigh Heads, Tweed Heads, Kingscliff, Byron Bay, Ballina, and everywhere in between. 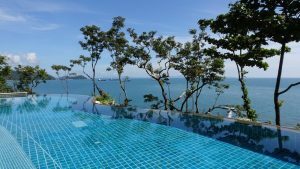 We supply complete pool maintenance & pool cleaning solutions for Private, Residential and Commercial pools, Body Corporate, Strata Managers and Pool Builders. Professional pool equipment installation and pool repairs . 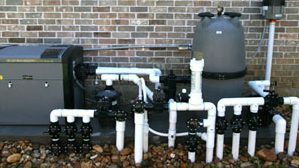 We can select and install all of your pool filters & pool equipment. 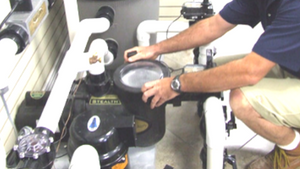 The Pool Gurus offer an installation service for clients wishing to purchase their own equipment. 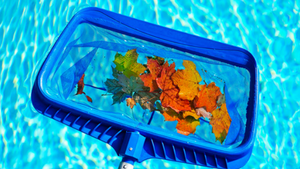 Specialists in Pool Maintenance & Pool Cleaning, we’ll clean your pool until it’s pristine. Enquire today for a price on set-and-forget pool cleaning plans. As pool renovation experts we can advise on repairs to all pool equipment or recommend replacements to suit your system and budget. Renovate your pool today! We deal with leading brands for pool supplies & pool equipment: Hayward, Zodiac, Davey, PureBlue, Onga, Waterco, Poolrite, Baracuda, Kreepy Krawley and many more. 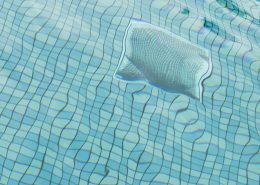 Our eco-friendly products and services are not only great for the environment but can also save you up to 70% on pool running costs. Contact us today on 0404 092 729 to for a quote. I saw the ad in the local Echo Byron Bay. Loved the business name. 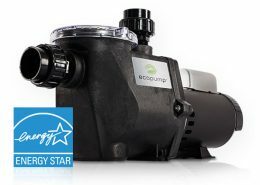 Laurence came out to our property and installed a new chlorinator and energy saving pool pump, also solved our black spot problem which we had for years. Our pool has never looked better. Thank you. Excellent service every time and reliable. If I ever have any queries Laurence’s is extremely helpful. The Pool Guru Laurence, is just what I needed. He is so helpful and taught me the tricks of the trade of how to properly operate, clean and troubleshoot problems with my pool. Recommend him to to all my friends. 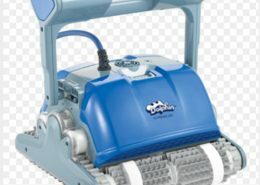 We purchased a robotic cleaner, super easy efficient and the best pool cleaner we have ever had. Would like to thank The Pool Gurus for re-tiling our old pool and new pool lighting … it now looks amazing and new. I can’t stop looking at it. Our skilled and friendly pool experts have the experience necessary to complete any pool maintenance job quickly and efficiently. Don’t hesitate to contact us for more information.